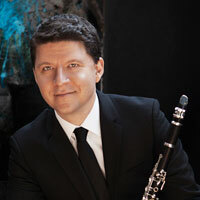 Clarinetist Alexander Fiterstein is one of the featured artists that will perform at the 2nd annual Banff Centre International String Quartet Festival, occurring from August 31-September 2nd, 2018. Mr. Fiterstein will perform works by Brahms, Ravel, and Shulamit Ran. Festival Director Barry Shiffman states: "Building on the success of the inaugural festival, this year brings close to 30 extraordinary musicians, including five of the finest quartets of our time to Banff for three exhilarating days."